What is it? 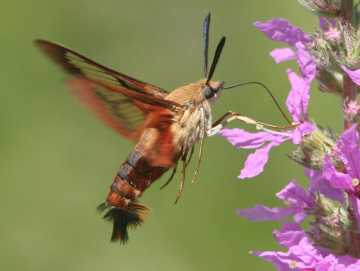 This unusual moth – the hummingbird clearwing moth – hovers like a hummingbird at a purple loosestrife flower in the Mass Fish and Wildlife fields while it drinks nectar through its long "tongue," or proboscis, which uncoils for use. This photo, taken at about 1/1000th of a second, stops the action of its mostly clear wings, which beat too rapidly to see. The thick, furry body and antennae without knobs are characteristic of moths. What's that big brown thing that just buzzed by, with its wings a blur as it flies and hovers at the freshest flowers in the field or garden? A giant bee? A tiny hummingbird? Some kind of strange butterfly? It's none of the above, but the closest guess would be "butterfly." Butterflies are near relatives. It's actually a moth, known as the hummingbird clearwing or common clearwing (Hemaris thysbe). Some people call it the hummingbird moth. It is about 1 1/2 inches long and has a wing span of about 2 inches. We associate moths with darkness, but unlike most moths, the hummingbird clearwing is active during the day, like bees and butterflies. It feeds on nectar, but it doesn't land on flowers to do so. Instead, it hovers in the air next to a flower, like a hummingbird. Its wings buzz as they beat so fast that you can't really see them. The wings are also mostly clear, which is why this moth is called a clearwing. Its wings don't start out clear. When this moth first comes out of its cocoon, it has scales on its wings, as other moths and butterflies do. But after its first flight, the scales fall off large areas of its wings, leaving them largely clear. You won't find this moth at your porch light. Look for hummingbird clearwings in the same places you might look for butterflies – in fields and gardens with fresh, brightly colored flowers full of nectar. Watch your butterfly bush (Buddleia davidii) if you have one in your yard. One good place to look in Westborough is the Mass Fish and Wildlife property off Rt. 135. Check the fields on the left along the dirt road going up to the hilltop where the radio-controlled airplane club meets. These fields are being invaded by purple loosestrife (Lythrum salicaria), which has been attracting lots of butterflies – monarchs, viceroys, tiger swallowtails, Eastern black swallowtails, and spicebush swallowtails – and hummingbird clearwing moths. Goldenrod, a good source of nectar, will soon be in bloom nearby. The hummingbird clearwing is a most unusual moth, with its hummingbird-like hovering flight and its daytime nectar-seeking. But in what ways is it like other moths, as opposed to, say, butterflies? For one, it emerges from a silky cocoon, as other moths do. Butterflies typically come out of a tough case – a chrysalis – rather than a cocoon. Both moths and butterflies spend most of their lives as caterpillars, which eventually either spin a cocoon (in the case of most moths) or make a chrysalis (in the case of most butterflies). The hummingbird clearwing's caterpillar spins a cocoon around itself among fallen leaves on the ground and stays inside through the winter, to emerge as a moth in the spring. The cocoon protects the future moth while it transforms itself from a caterpillar to an adult moth. What else about the hummingbird clearwing is moth-like? It has plain antennae, like most moths, rather than antennae with knobs or clubs on the end, like most butterflies. Also, like most moths, its body is heavy and furry-looking, instead of slender, like most butterflies. The bulky body is one reason that people sometimes think of a bee, such as bumblebee, when they see this moth. Its body is brownish-orange with a darker band, colors that help to remind people of a bee or wasp. But this large creature won't sting – it's a moth. If it also reminds predators of a bee or wasp, this harmless moth may escape some harm. What's the caterpillar like? It's green, like so many caterpillars, but it has a yellow horn on the rear of its body. For this reason the caterpillar is called a hornworm, like the caterpillars of most other moths in the same family (Sphingidae). The moths in this family are also known as sphinx moths or hawk moths. What does the hummingbird clearwing hornworm eat? It depends on particular plants for food, as other moth and butterfly caterpillars do. It typically feeds on viburnums and honeysuckles (both in the Caprifoliaceae family), including native plants as well as the non-native invasive honeysuckles that people so love to hate. Fortunately, it doesn't share the same tastes as the tomato and tobacco hornworms (Manduca quinquemaculata and Manduca sexta), which vegetable gardeners and farmers may know as pests that ravage tomato, potato, and tobacco crops. This year appears to be a good year for hummingbird clearwing moths in Westborough. Several people have noticed them and asked what they are. Our fields and woods have no shortage of viburnums and honeysuckles, and rains have encouraged a lush bloom of nectar-rich wildflowers. So if you haven't yet seen a hummingbird clearwing moth, keep your eyes open for one in your garden, in a field, or along the trails in town.